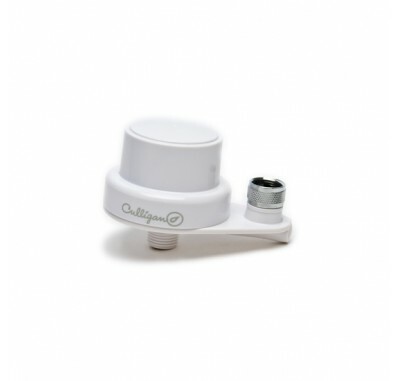 The Culligan ISH-100 shower filter system is a white inline shower filter that fits easily onto showerheads. The Culligan ISH-100 inline shower filter attaches easily to the existing standard 12-inch shower arm at one end and then to the existing showerhead at the other, without affecting the height or positioning of the showerhead. The Culligan ISH-100 shower filter system prevents drying of skin and hair and prevents chlorine damage to hair texture and color-treated hair. The Culligan ISH-100 shower filters prevent inhaling of and absorption of chlorine during showers. The Culligan ISH-100 Shower Filter reduces odor and sediment. The Culligan ISH-100 is bacteriostatic. The term bacteriostatic indicates that the system limits the passage or growth of bacteria that may already exist in the incoming water. 1 Year Warranty. The Culligan WHR-140 shower filter cartridge is included with the purchase of the Culligan ISH-100 shower filter system.